Thai King Signs Military-Backed Constitution : The Two-Way This paves the way for Thailand to hold elections in the coming months, but critics say that rather than promote democracy, the document only solidifies the power of the military. Thailand's King Vajiralongkorn Bodindradebayavarangkun (right) endorses the constitution document in a ceremony on Thursday in Bangkok. 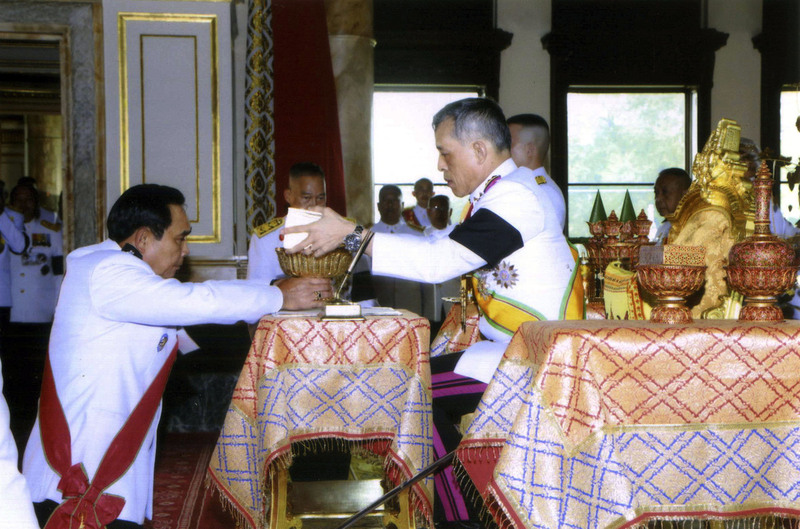 In an elaborate ceremony, Thailand's king has signed the country's military-backed constitution. The document paves the way for Thailand to hold elections in the coming months, but critics say it only solidifies the power of the military. Voters approved the constitution by a wide margin last August, two years after the Thai military seized power in a coup, as The Two-Way has reported. The junta has argued that this constitution was badly needed to restore stability. The new constitution "constrains further elected governments with an appointed senate, and commits governments to follow the military's 20-year development plan," according to the BBC. But this is actually a slightly different document than the one Thailand voted on. It contains six changes made at the request of new King Vajiralongkorn Bodindradebayavarangkun, who acceded after the death of his father in October. Those changes expand the power of the monarchy. For example, according to the Bangkok Post, the king may leave the country without appointing another regent. Also, it removes a requirement for the king to call a meeting with the heads of top courts and the Senate in the event of a constitutional crisis. "Thailand has had so many constitutions in its modern history — this is the 20th since 1932 — that many of them were introduced with little fanfare," the BBC reports. But the extravagant ceremony requested by the king is seen as a sign of "royal approval," the broadcaster adds. "Officials beat gongs and blew trumpets and a royal guards band played marching music, followed by a 21-gun salute by the army, navy and air force. "Temples throughout the country simultaneously recited prayers, rang bells and beat drums." Rights groups were critical in the lead-up to the referendum, saying that the ruling junta had stifled dissenting opinions and debate about the draft. Dozens were reportedly detained for encouraging people to vote no. Now, Amnesty International is concerned that the new document will not protect human rights, as the Associated Press reports. "Thailand's military government retains its carte blanche authority to rule by diktat until elections are held, and future governments will have free rein to restrict human rights on various vaguely defined grounds," Amnesty's director for Southeast Asia and the Pacific Champa Patel told the wire service. "The new constitution also keeps in place the full gamut of orders and decrees imposed by the military government since the 2014 coup, which have facilitated widespread human rights violations." The timeline for elections is not clear. As Reuters reports, Prime Minister Prayuth Chan-ocha said in televised remarks that the country could now hold a vote "within the 19 months set by the constitution" but did not provide an exact date.